Name means: "Authentic" or "Real(ly)"
The music group from Flensburg started out as a school band. It was during a foreign exchange year in Carlisle, England in 1994 that they inspired their first fans. Over the next few years they financed the production of their own CD and sold over 1000 copies at performances they gave. 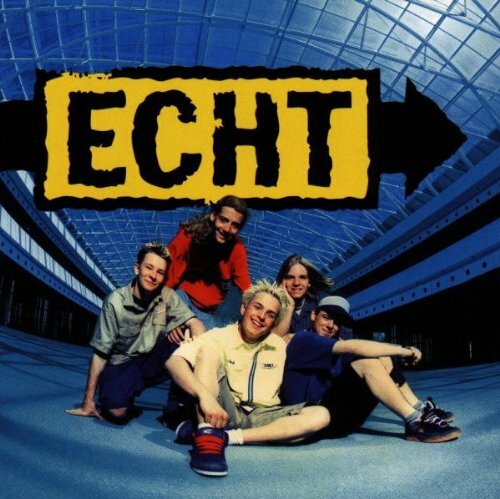 Unlike other boy groups, Echt often composed and wrote their own music and they were truly friends who made music together. The band gained the attention of the Hamburg label Laughing Horse Music, who signed them and produced their debut single "Alles wird sich ändern" which appeared in 1998. In October, their debut album Echt (listen to outtake ) appeared and they began a tour through Germany, Austria, and Switzerland. The album made the Top 5. Their second album Freischwimmer (listen to outtake ) appeared in 1999 and had reached gold status by early 2000. 2001 marked the end of Echt's popularity. Contrary to the success of the first 2 albums, the band's 2001 album Recorder was sharply criticized. The tour had to be cancelled due to lack of ticket sales. The band had grown up, but apparently not everyone concurred that it was a positive change. TRACKS: 1.Alles wird sich ändern | 2.Auf der sonnigen Seite | 3.Fort von mir | 4.Nicht so furchtbar schlau | 5.Göttchen | 6.Lehn Dich | 7.Wir haben's getan | 8.Ich leg mich hin | 9.Mädchen mögen Sieger | 10.Mein kleines Universum | 11.Wo bist Du jetzt ?